Administered by the Woodrow Wilson National Fellowship Foundation, the Newcombe fellowship program supports Ph.D. students in the humanities and social sciences whose work has “significant potential for advancing academic scholarship related to ethics and/or religion.” Out of more than 500 applicants, just 21 students were selected to receive fellowships for 2011–2012. “During the late 19th century, northern American cities like Chicago experienced deep unrest as a vast, poor, and predominantly foreign-born work force faced off against a small but fabulously wealthy elite,” Carter says. “Strikes, riots, and violent confrontations in the streets were common, many of these sparked by questions about wages, hours, working conditions, etc. Carter says poring over census data and church membership rolls helped him understand who was sitting in the pews of the churches he studied—a diverse collection of carpenters, lawyers, painters, and financiers, among others. He draws extensively on reports from labor, socialist, and religious periodicals, as well as Chicago’s daily newspapers and foreign language press. Carter has already won several honors for a chapter of the dissertation he adapted into an article, “Scab Ministers, Striking Saints: Christianity and Class Conflict in 1894 Chicago,” which was published in American Nineteenth Century History. 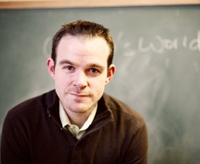 At Notre Dame, Carter’s article won the Higgins Labor Center’s John Joyce Prize for Best Paper in Working-Class Studies and the 2011 Phillip Gleason Prize for the best paper published by a graduate student in the Department of History. During summer 2011, Carter will also be one of four Ph.D. candidate fellows working on the University’s Religion Across the Disciplines, a new initiative investigating the influence of religion in history, international relations, literature, music, and sociology, as well as the influence those fields have on religion itself. Originally published by Joanna Basile at al.nd.edu on July 12, 2011.